The idea of baking chocolate cookies came to my mind while making a chocolate cake for my brother-in-law's birthday. While the cake was in the oven my entire kitchen, whole appartment in fact, become filled with a wonderful aroma of chocolate. No one could resist that. Neither could I. So, I decided to bake something with chocolate also for myself. 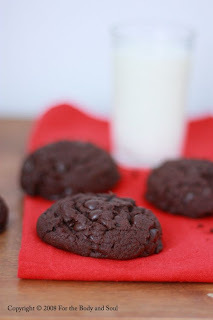 I opted for these totally chocolate chocolate chip cookies recipe. As the name says, the cookies tasted totally chocolate and made my kitchen smell chocolate not less than when I was baking the cake. Needless to say, they were also totally delicious!! 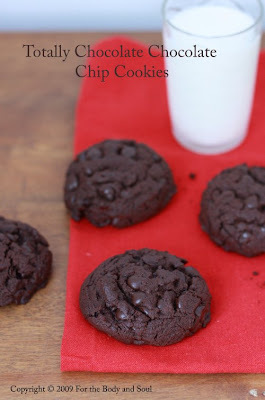 The recipe makes 12-14 cookies - it doesn’t sound like many, but believe me, even though they’re truly delicious, it’s almost impossible to eat more than a few. They’re just too...chocolate. 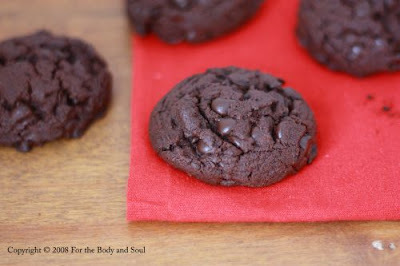 The recipe for these extremely chocolate cookies comes from Nigella Lawson (see the video below). The only change I’ve made was using golden caster sugar in place of regular white sugar. 1. Preheat the oven to 340°F (170°C). Line a baking sheet with parchment paper. 2. Melt the 125 g chocolate in a heatproof dish over a pan of simmering water. 3. In a medium bowl combine the flour, cocoa, salt and baking soda. Set aside. 4. Using an electric mixer, cream the butter and sugars. Add the melted chocolate and mix again until completely combined. 5. Add vanilla extract and cold egg. Beat until well combined. 6. Add the dry ingredients, mix on the lowest speed until well combined. 8. Using an ice-cream scoop, scoop 12-14 mounds of the dough onto prepared baking sheet, spacing the cookies about 2.5 inches (6 cm) apart. Do not flatten them. 9. Bake for about 18 minutes. Leave on the baking sheet for 4-5 minutes, then transfer to a wire rack to let them cool and harden. Oh, these are really good - I made them already and everyone loved them! Yours look delicious and I love the photos, too!